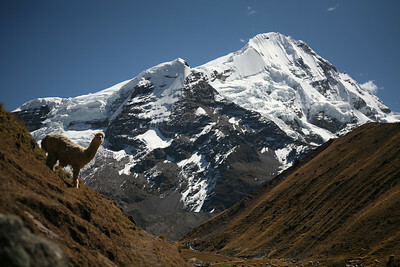 Our main objective in the two days we were back in Cusco was to get ready for the Ausangate trip. This included getting plenty of rest and getting our gear together. I needed to rent plastic mountaineering boots, crampons, an ice axe and a harness. Martin found Alfredo, a guide with Andean Destinations, who had everything I needed including a set of Asolo boots that were well worn. Nay, beaten – these boots had chunks of foam missing, delaminating Velcro, packed out liners and they stunk to high heaven. But they fit perfectly. Dave and Martin went shopping to get our rations for the trip sorted out and now that the trip has passed, I can say they made some excellent choices. Though, most of the credit goes to our trip cook, Jose. I noticed he did some shopping along the way on the trek. Picking up fresh veggies and fruits from farm stands along the way and whipping it all up into multi-course gourmet meals each time we sat down to eat. Instead of departing Cusco early in the morning as planned, we left late the night before for two reasons. First, the solstice celebrations were on the cusp of jamming up the city and second, the rumors of a farmers strike that we started hearing about in Patacancha were getting louder. They have been known to roll massive boulders out into the middle of the road in the wee hours of the morning just to jam things up to make their point. We wanted to avoid this so we made a late night escape out of the city to the small town of Tinki. We rolled into Tinki around 1am after the 3 hour drive. Martin had made arrangements at a hostel in town but with the lack of street signs or specific addresses they couldn’t find the hostel. Fortunately, there was only one main street and our horseman, Pablo, from a near by town, was already there awaiting our arrival. What was unfortunate is Archilies, our driver, drove up and down the main street honking his horn trying to get Pablo to come out and tell us where we were. As we woke from the daze that was just a partial nap during the drive up, Rob, Dave and I sunk deeper into our seats, embarrassed by the noise we were making in this small sleepy town at 1 O’clock in the morning. Finally, we found Pablo and pulled into the small courtyard hidden behind large wooden doors from the street and unloaded our gear (Archilies was going back to Cusco that night) and loaded ourselves into bed. Hours later, still dark out, we heard that honking horns up and down that main street was not totally uncommon. Though, it didn’t really make me feel any better about it. The next morning, I was up relatively early. 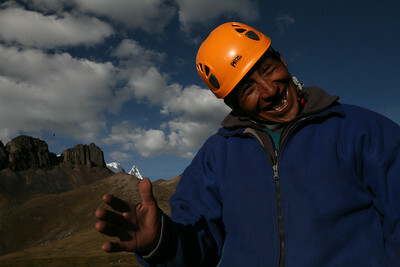 I got to meet Pablo in the light along with his wife, Margarita, who would be coming along on the trek with us. Martin said his first time working with Pablo, things did not go so great. But the next time, when Margarita came along everything went smoothly. As Pablo sussed out how much equipment we were bringing (they were used to doing this trip as just the trek, but not with the extra climbing equipment needed to make a 6,000+m summit bid) he realize he needed one more horse. Somehow, I ended up walking with Margarita up to the local market which was already abuzz and into a small room. She kept saying to me “radio, radio”. I didn’t know if that was Spanish, Chetchwa, or what. It turns out it was English. In this little concrete room was a smaller plywood shack that contained a man, a wall of cassette tapes, a small control board and a microphone. 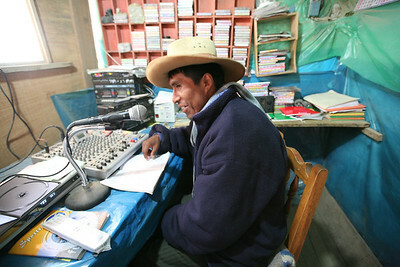 This was the local radio station and Margarita paid him to announce that we were hiring an extra horse and if anyone wanted to rent us a horse, to bring it by the hostel where we were packing things up. Amazing. Back at the hostel, Jose had turned a 100-square meter room into his kitchen and our dining room. A colorful woven tablecloth provided the background for the neatly laid out silverware and condiments needed for breakfast. A tall blue thermos stood at the ready with hot water and an assortment of teas sat in a small basket. Rob, Dave, Martin and our guide Socrates (Socra for short) gathered around for porridge followed by pancakes lathered in butter, sugar and/or jam at our discretion. While Jose, Pablo and Margarita packed up the group gear and loaded the horses, we started off by walking past the radio station to a registration booth where we signed in and Martin paid our trekking fees and we continued along the river. We crossed the river and popped up out of the river valley and got our first good look at the massive snow peak we were intending to climb. Ausangate jutted up from the horizon and we paused for a moment in the small town of Pinchimuro to snap a few photos and gaze in awe at the nevado. We hiked along the road, stopping once for snacks then descended into Pacchanta. The horses had passed us on the road while we were stopped and Jose had already set up his kitchen and had hot drinks ready. We rented a small building in which the kitchen and eating area was down stairs and we slept on the floor of wooden planks with thin, firm mattresses on the second floor. 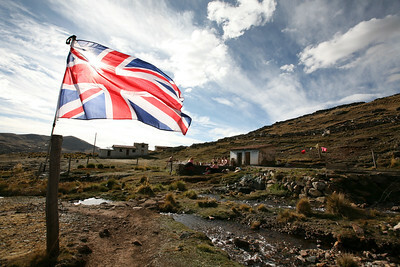 A large group of British trekkers were in the hot springs and they erected the Union Jack on a trekking pole to steak their claim, in a way. Very British, really. The implications of doing this with an American flag flirted in my thought, but it was quickly dismissed as I recognized and marveled at the very different message and attitude that flying the Stars and Stripes would carry. After lighting the clouds up into a fiery show of red and orange, the evening sun glowed pink and purple on the face of Ausangate and we made our way to bed after another amazing meal. The appetizer of which was an amazing fresh avocado salad. This is were the road ends and we continued on the trail up into the mountains. First along a wide valley, then up and over ancient moraine mounds until we reached and wove our way around a series of lakes. The mountains, ever in view and getting bigger all the time. Our camp, at 4,600m (15,200ft) called Pucacocha (blue lake) was set on the shore of the larger of the lakes and after a small rest and snack we hiked up another moraine mound to get a good view of the route up our first peak, Campa. Before we started our scouting trip, an interesting conversation came from the location where Pablo had decided to put the toilet tent. Without any trees at all toilet privacy becomes tricky so an outhouse shaped tent is brought and placed over a hole dug in the ground. Martin has made it more comfortable by designing a custom made chair with a toilet seat on it. But Pablo decided to put this whole kit just up stream of our campsite. Our American Leave No Trace (LNT) sensibilities were jarred by this and we mentioned it to Martin, solely as a suggestion. He was very receptive and was eager to learn more about how he could be better at taking care of the environment. We discussed some of the finer points about caring for water sources, toilet processes and other LNT ideas. We’re going to send him a LNT book when we get back home. The scouting trip helped put the approach to Campa in our heads so we will have an idea of what we’re doing come 2am and we’re heading up in the dark. Back at camp we sorted our climbing gear and prepped it all for the early start. Our Peruvian hosts were fascinated with all of the gear. They had never seen anything like this before. We got a great shot of Pablo wearing a helmet and holding an ice axe. Jose had dinner ready early and we were in bed just after dark. The Big Dipper was upside down on the horizon when we bedded down and gone when we woke up. Jose was up before us and brought us some tea in our tents to wake us. We had a warm breakfast then started heading up the hill. Socra joined us expecting to turn back when we got on the snow. After a few hours in the dark, the sunlight reached us as we reached the snow. The ramp onto the snow was a bit steeper than we expected and while we got out the climbing gear, Socra continued traversing along to explore some. After half an hour, Dave was roped up and leading up the snow while I was belaying him. He had one ice screw in when he looked back and said it was pretty crappy climbing. I think it was just then that Rob noticed a figure on the snow way to our left and up on the mountain. It was Socra. It looked like he found an easier way up and we quickly agreed we should move around to that part of the mountain. We climbed down through a talus ravine and back up again. When we reached the ramp Socra was on, it didn’t look as if we needed to be all roped up and wearing crampons and the full kit. But we figured it would be good practice to get everything out for a shake down and to work on traveling as a rope team before we got super high up on Ausangate. We traveled well as a rope team and some good group dynamic team building came from it. 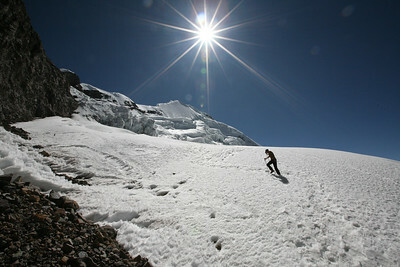 We had to work our way though some deep suncups which was good practice while wearing crampons. 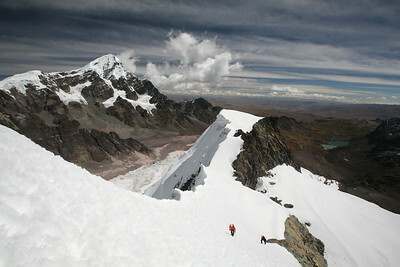 At 5,300m we crested out to a small plateau from which the summit mound jutted steeply up. Socra was already on the summit and looking quite happy with himself. 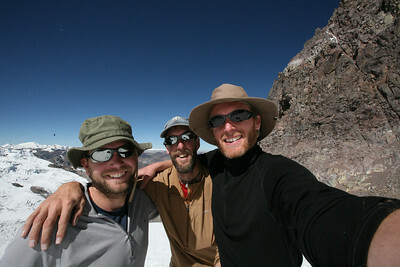 From here, we ditched our packs, rope and harnesses and made the steep summit push. There was one little band of rocks to cross where the snow couldn’t maintain its hold. But that was the only tricky stretch with our crampons. The view from the top at 5,500m was of course awesome. We took time to have a little rest, took some photos, had a snack and radioed Martin to tell him of our success. Coming down was fun in the sun-softened snow. We came down a different way to meet Martin further along the trail. 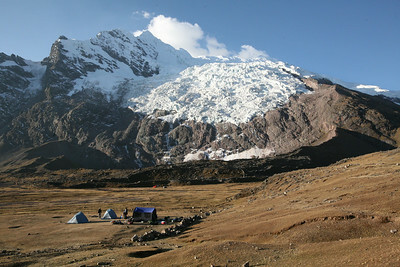 While we were on Campa, base camp had been struck and moved closer to Ausangate. There were a few little crevasses to cross and a few sections where we wished we had left our crampons on. Finally, after weaving through and over the bigger rocks, we came off the mountain via a huge talus slope taking big sliding strides. We were spaced out to prevent falling and kicked rocks from hitting each other. The next day was pretty big. We hiked the whole morning, mostly down hill and covering a lot of distance to the Patagancha Valley where we set up base camp for the big push up Ausangate. Jose made lunch and at 3pm we loaded up the horses with just the climbing gear to head up and establish our advanced camp. The horses laden with gear got us a mile closer to the mountain when we had to leave them and start carrying all the gear ourselves. Martin, Jose, Pablo and Socra all came along and took a load up the steep mountain side. Base camp sat at 4,600m and after climbing into the early evening the boys needed to drop the gear and head back so it wouldn’t get too dark on them down the steep slope back down to the horses. 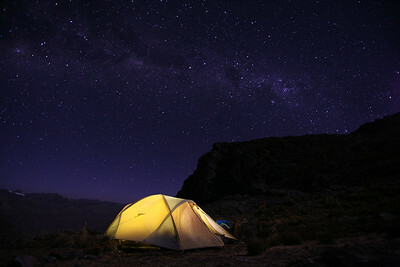 Rob, Dave and I found a suitable tent site near by and set up camp, cooked dinner and headed to bed. It was a very tight squeeze for the three of us to cram into Dave’s little tent. He’s had this tent for ages. Dave used this tent when we climbed Mt. Rainier in 1994. Packed in as tight as we were, we were roasting in our 0F bags… Rob was in -20F Marmot Col bag and was REALLY warm. I slept great, but Rob and Dave admitted in the morning it was a fitful night for them. Just as the sun started to light up the sky, Dave opted to go sleep outside, I got up and got dressed to explore our area some and take some photos and Rob remained in the tent. This was when the two of them got the bulk of their sleep. When I got back from poking around some, the sun had crested the far ridge east of us and Dave was just starting to roust. He then took a little morning walk while I put some notes in my journal and basked in the morning sun with some snacks. It was of course a brilliant beginning of a day as can only be expected at 5,100m. Rob woke up, Dave got back from his walk and we made a simple breakfast of oatmeal and discussed the plan. From what Dave and I saw on our morning walks, we didn’t think it was worth the effort of striking camp and just moving it up the hill a few hundred vertical feet as that was about all we had before hitting more steep rock and snow. So we opted to just haul our heavy climbing gear: ropes, crampons, ice axes, helmets and other pieces of hardware, up as high as we could before getting into a technical situation. We made our way up the steep moraine deposits and were only slightly baffled when we reached the foot of the cliffband when we felt like the trail was going the wrong way. But we trusted it and ended up finding our way up what I’ve called the Emerald Chute. The rock was distinctly green and it was right up a narrow steep ravine. Once above this, it was a steep series of switchbacks and traverses across uneven and unsettled rocky ground. There was a ‘trail’ but only in the sense that they had stacked cairns and it only looked like maybe half a dozen others had ever walked here. What did surprise me were the occasional llama tracks. My guess is previous climbers strapped a bunch of their gear on the mountain terrain hardy camelids and set up camp higher up. Sure enough. We hit 5,400m (17,700’) and there was a very small flat shelf of an area where a small tent, much like ours, could squeeze into. At this point, nobody was disappointed that we hadn’t hauled our whole camping kit up this far. I dropped my pack and bounded my way up to the ridge line that separated us from the main valley where base camp was located. It was just short of Noon and we were due for a radio check-in with the valley. I had a good chat with Martin and we agreed on a 5pm check-in. This was tentatively about when we should be back at our advanced camp, finishing dinner and tucking in for a early bed time due to the 2am rise to start climbing towards the summit. But when I got back down to the mini-camp where Rob and Dave were resting and getting some water they asked me what I thought of the route. Looking up, I said it didn’t look ideal, but it looked good enough to give it a go. I didn’t understand the question. There had been discussion between the two of them about not doing the climb at all. With the poor quality of sleep the two of them got last night, Rob still recovering from whatever disagreed with his stomach a few days ago at Machupicchu and Dave saying that he has a piercing headache and was totally wiped out by this last uphill stint, they were considering calling the whole thing off. This is always tough news for any climber, especially the ones who are not feeling well, to hear. I suggested we just leave our packs here and pop up a touch higher where we would transition from rock to snow and to see how that makes us feel. We gained 100 more vertical meters to the snow ramp onto the glacier and the sentiment was the same, though nobody wanted to call it all off. We walked up onto the snow, just to feel it under our boots and I said definitively: “We’re not going”. Rob and Dave nodded in disappointing agreement and we talked through why not going was a good idea. What we had before us was a massive undertaking. We needed to all be at the top of our climbing game to make this work. As a team we were each dependent on each other to know if one of us slipped, the other two would have enough wits about them to arrest into the snow to prevent the whole lot of us from sliding right off the mountain. Then, once we got to the headwall things would start to get very technical as we would have to set up a solid belay system where only one of us could climb the ice wall at a time, set up a shelf to belay from as the other two climbed up to that point then climb up again. Finally, there was the knife-edge ridge that led up to the summit. By then, we would be above 6,000m (19,600’) and the air would be considerably thinner than were we stood now. In short, we all needed to be at 100 per cent and we were not. We took some photos and breathed a sigh of relief and consoled our continued disappointment. The last thing I said before we headed down was to really take a moment and remember how we feel, fitness wise here and now. Because once we drop a few hundred meters, the air will thicken up and we’ll start to feel much better and our thoughts will try to convince us that we could have made it and should be sticking with the original plan to head for the summit. It was quiet going as we tromped our way back down the steep loose rock slope to get our bags and take all that climbing gear back down to camp. I tried to hail Martin and the base camp crew in the valley of our change of plans to see if they could bring the horses up as far as they came last time and for the guys to come up and help us haul our camp off of the upper mountain. We didn’t want to deal with another sardine packed night in Dave’s little tent if we didn’t have to. Back down through the Emerald Chute and along the moraine deposits, the afternoon shadows got longer and longer until the ultimate shadow, that of the very peak we were no longer going to push for, overtook us. Martin never came back on the radio, so when we had our advanced camp packed up into our three overstuffed backpacks and three huge duffle bags we figured we could manage to carry two bags a piece and started our way down. The thicker air had indeed raised spirits and strength. Continuing down was still steep and tricky and we each wrestled with our duffel, at times draped in our arms, slung over top of our backpacks, or even moved along next to us like a walking stick. As expected, the team at base camp were very surprised to see us when they did and they were quick to jump to action to help make us comfortable as we told them about what we encountered higher on the mountain. Jose got on dinner and had some warm snacks and hot drinks ready as he made some amazing pizza from scratch. Not nearly as fast as just throwing in a frozen pizza (like that was even an option), but it was so much more delicious. Dave and I slept very well that night and Rob was still having a rough time overnight. Because we were down a day earlier than planned, we opted to continue the same way we were going on the trek, which was only sightly longer than going back the way we came in, which was the original plan. As we hiked around for the next two days we got some amazing views of Ausangate and we appreciated being able to see it from every side. As we walked, we didn’t linger on the upper mountain decision to turn around. Sure, it came up in conversation every now and then, and when we met folks on the trail, but even though being at a lower elevation did try to make us feel like we could have pushed for the summit, we remained confident in our decision to call off the climb. What did come up more often was the talk about how we’re going to approach it when we come back next year to try again. On the second day after coming off the upper mountain, we hiked into the small town of Tinki (actually, there was very little sign of any sort of town save the occasional fence, small hut and vast fields filling a wide valley). This is the home town of Pablo and Margarita, our horseman and his wife. We didn’t go to their house, but we did have lunch there before making the last push from Tinki to Pacchanta. This was possibly one of the most beautiful stretches of trail on the trek. It’s not how Martin usually runs his trips and this was the first time he had ever walked this stretch himself. After we crested the eastern ridge out of Tinki, the trail faded away and we were just walking on the soft short shrubby grass over beautiful rolling green hills. The white craggy north face of Ausangate jutted up from the green horizon and accompanied us all the way back to Pacchanta where we could watch the evening glow of the sun fade from Ausangate as we soaked in the Pacchanta hot springs. This entry is filed under: Blog, Climb, Earth, Hike, Photography, South America, Video.